The Lochness Marathon is approaching fast, and with it my turn to be the support crew. 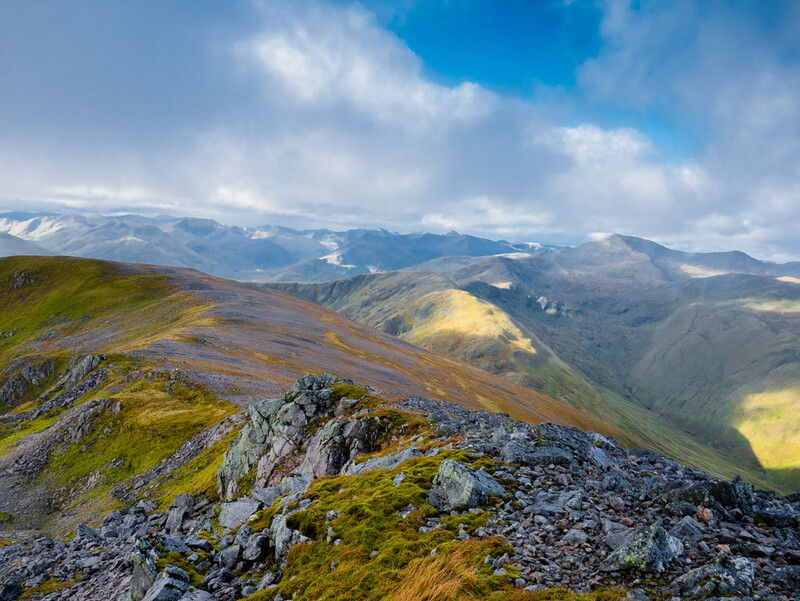 Because of the race logistics there is a fair bit of hanging around ... but Glen Affric being just down the road, I know the perfect way to 'kill' the time -- the Carn Eighe loop is just the right length to be back at the finish line in a good time! A run along a great natural line, without any significant technical or navigational challenges, yet offering stunning views, on the edge of one of the more remote feeling parts of Scotland. From the carpark at NH 216 242 head up the track following the river, then just after crossing Allt Toll Easa take the path following its W bank. After about half a km a path not on the map heads up the Creag na h-Inghinn ridge -- take this to the Tom a Choinnich summit (NB: Allt Toll Easa is the last available water source for the whole of the horseshoe). Follow the obvious ridge line onto An Leath-chreag, Carn Eighe and Mam Sodhail. From here continue along the E ridge onto Sgurr na Lapaich, and descent along the SE ridge into the glen to pick up the path toward Affric Lodge, and from here along the track/road back to start. The Sgurr na Lapaich descent is not the only option on this run, as there are two other inviting, even irresistible, ridges just little farther to the SW of Mam Sodhail. 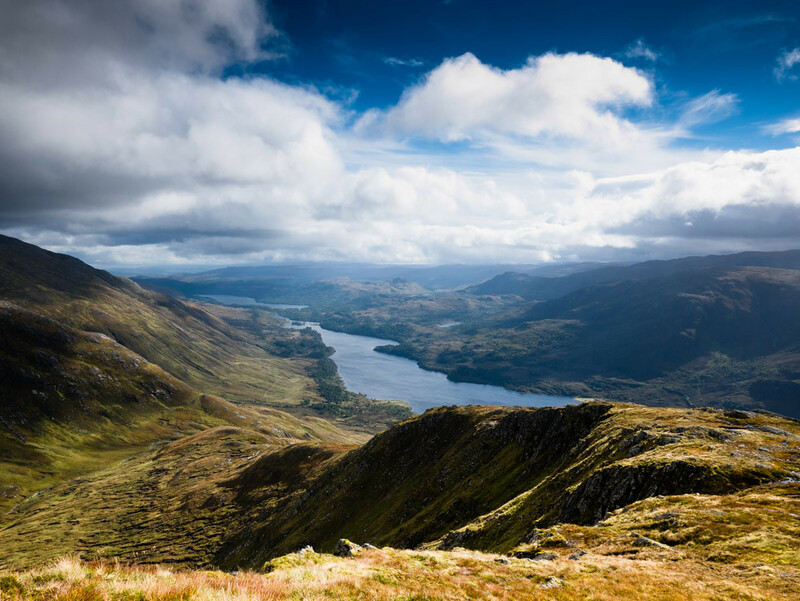 When time (and legs) permit, it is well worth to follow the SW ridge over the 1108m, 1068m, and 1055m points as it curves around the spectacular Coire Coulavie, for it offers the single best view of Loch Affric that there is to be had. The ground is a little bit more technical, as there is no path through the rocky, but generally enjoyable, terrain. 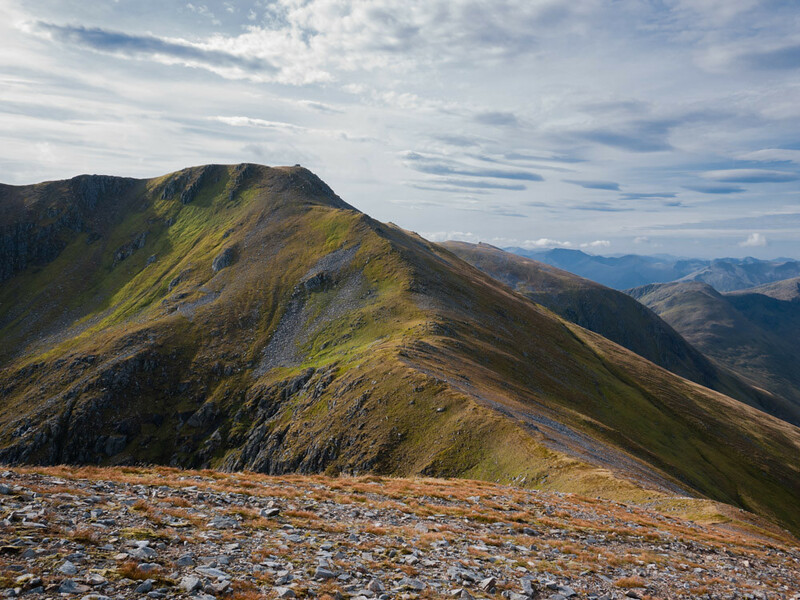 To reach the floor of Glen Affric, negotiate your way down Creag a'Chaorainn as the ridge curves NE onto the the flat area at around the 750m contour line. From here a direct descent S is possible, however, the grassy slope is very steep, the ground is pocketed, and sodden, and lot of care is required. I suspect a better option might be to descend N into the coire and then pick up the stalker's path marked on OS map) below An Tudair Beag. The path on the floor of Glen Affric provides enjoyable running through a lovely Caledonian pine woodland, worth a visit in its own right. Follow this toward Affric Lodge and from there back to start along the road.